It is often wrongly assumed that senior persons should not or need not exercise. Even those who are ridden with conditions such as heart disease, high blood pressure, diabetes and arthritis can exercise safely. Consult a physician before you start your fitness regime. 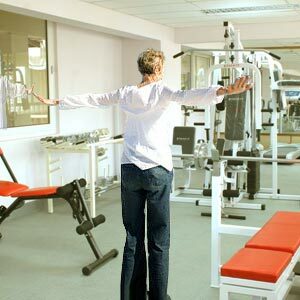 There are certain exercises which are specially designed for senior age group. In fact a simple and regular exercise regimen can go a long way in maintaining flexibility and enhancing overall feeling of goodness. Stretching exercises: They mainly help in keeping the body flexible, supple and limber. Balancing exercises: They provide high end stability and proper balance by reducing the chances of fall. Endurance activities: They involve activities like swimming, riding, cycling to improve the blood supply to circulatory system. Strengthening exercises: They help in building muscle tissue thereby avoiding muscle loss. They increase muscle mass thereby preventing bone fracture and osteoporosis. Exercises could be followed based on following consideration: age, health conditions and overall fitness level. Various kinds of exercise can be followed depending upon their adaptability, comfort and age. The person must basically enjoy his fitness regime; it's only the joy and pleasure which leads to the benefit of exercise. Walking: Walking is probably the most common and easiest exercise for elderly people. Walking is beneficial for all age groups. It is inexpensive and doesn't need any trainer to teach you. Jogging: Jogging can burn more calories than walking. But, this must be attempted only after checking the fitness level and on consultation with a physician or fitness consultant. Bicycling: Bicycling is an active sport that also lends an opportunity to move around at your own pace. It is necessary to wear a helmet and knee caps to avoid any injuries. You can also work out a sweat on a stationary bicycle at home. Swimming: Swimming is ideal for joint problems as exercising in water adds resistance to body without any side effects. It increases the heart rate without jarring fragile bones and ligament. Mowing the lawn: Mowing the lawn, walking around the garden is as good a physical exercise for old age people as any other. Relax in your backyard as you also get a chore done. Yoga: Yoga helps to stimulate the organs, improve blood circulation and control the blood pressure and sugar level. Yoga along with specific techniques like meditation lends the ability to focus on the environment and feelings. Never exercise on a full stomach. Wait for at least an hour for the meal after doing the exercise. Always start with warm ups. Gradually increase the intensity and duration of the exercise. Never do the activity when the symptoms like chest pain, shortness of breath, irregular heartbeats occur. Take a bottle of water to replace the lost body fluids. Never wear a tight fitting garment. Prefer light weighted minimal clothes. Use safety measures like knee caps and helmet while cycling. If you notice symptoms like chest pain or difficulty in balance or nausea, discontinue the exercise and consult a doctor. Exercising increases energy and boosts confidence levels. It is important to lose weight and stay fit without any injuries - especially as you get older. Although seniors are capable of doing exercises, their activities will differ from youngsters. A proper workout consists of about 8-10 exercises. The beginner sessions should involve relatively less activity with lower weights and then gradually the weights must be increased. A good workout always includes slow controlled movement, full relaxed inspiration and expiration. Exercise should be an integral part of life. Exercise leads to new dimensions of life without any complaints. Exercising is not impossible for seniors. They can keep them active by doing some simple movements like stretching their hands and feet, curling toes and abdominal crunches. Relief from pain due to arthritis. Helping to cope with depression that comes with advancing age or health conditions. Delaying the onset of health conditions like osteoporosis, cardiac problems and diabetes. Overall feel good factor due to improved circulation, better energy and enhanced self confidence. Keeping dementia and Alzheimer's disease at bay due to the benefits of regular exercise. If you are part of a senior exercise program, you are also likely to benefit from the social interaction. Regular exercise is likely to result in good sleep enhancing energy and reducing effects of fatigue. First Published Date: 11 Mar 2009 Last modified Date: April 18 2019 This page may have been updated recently as new information is available or the content may have been edited for better readability.